We first start with an initial consultation to start the process of designing your dream outdoor space. We will discuss what is important to you and carefully listen to your needs and ideas. Our team will then study the architecture of your home and it’s existing features in order to create a design plan that complements your home. We will also offer our professional opinion to ensure that everything goes smoothly. 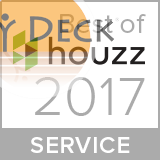 We will work with you step by step throughout the entire process to create a beautiful, customized deck that will add value to your home and last a lifetime.